I would have been happy with just about anyone Obama was considering for the VP slot, but I am particularly pleased with Joe Biden. I think my biggest problem with Evan Bayh and Tim Kaine was the prospect of having to listen to the big hissy fit that SOME Democrats were prepared to throw had they been selected. I swear, I have heard far too much carping and whining from people on the Democratic side since the end of the primary season. It’s a wonder that Democrats ever get elected these days. Nevertheless, I think the hype about all the disunity at the convention is just that — HYPE — and it is best to just follow the advice of Public Enemy and Don’t Believe It. I think most all of these disagreeable and disgruntled folks will eventually fall in line, just like all those wingnut bloggers who swore a few months back that they would never vote for McCain are now all firmly on board. But first they have to get their time in the limelight, like the handful of South Texas Hillary delegates who keep getting written up over and over and over again by the San Antonio Express-News. 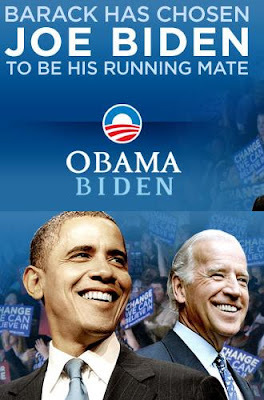 But back to Biden, I think he is an excellent choice. Unquestionably experienced and qualified to step in and take over as president, he will also be a great asset to the campaign as someone who can aggressively strike out at the Republican noise machine. I remember feeling sorry for Biden when he had to drop his 1988 presidential campaign after one of his speechwriters borrowed too profusely from British Labor Leader Neil Kinock. At the time, borrowing phrases was not uncommon, but a new standard was being set as the global information machine was starting to evolve. My friend Mark is already giddy over the prospects of the “GOP ridicule machine” going after Biden over these past charges of plaigirism. But I think that will be a little difficult to do when their standard bearer likes to crib recipes from Good Housekeeping, does his foreign policy research with Wikipedia and borrows inspirational stories from Aleksandr Solzhenitsyn. I was glad to see Biden re-emerge as a political force after his failed ‘88 campaign and it was pretty clear that he was in line for a major cabinet post in an Obama administration had he not been tapped as VP. But the VP slot is an excellent place for him right now. Once they finish fumigating the vice president’s office and sweep up all the shredded pieces of the Constitution, hopefully he will be able to get in their and start piecing things back together so that our country can finally get its reputation back.